Asia Society Texas Center will welcome the Houston community to its new home with an Open House and First Look Festival on Saturday, April 14, and Sunday, April 15. Music, dance, and acrobatics, art exhibitions, storytelling, and tours of the building will be among the offerings during the two-day celebration. Admission is free, and all are welcome. The festival kicks off at noon Saturday on the Texas Center’s Festival Lawn with the first U.S.performance by Osaka-based Hikeshi Naniwa Tobi, a 14-member troupe that demonstrates traditional fire-fighting techniques of the Edo period (1600-1868). Performing acrobatics atop a 22-foot-tall bamboo ladder, Hikeshi Naniwa Tobi pay homage to thosewho battled blazes in Japan at a time when wood and paper houses made fires a constant threat. The troupe also will perform dezomeshiki, a chant-filled Japanese New Year’s ceremony to ensure fire safety in the coming year. · A performance by Cameron McCarthy, an Aboriginal Australian artist and public speaker who incorporates the evocative sounds of the didgeridoo into his traditional tales. · A concert by The Mountain Music Project, featuring Nepalese folk musicians and Appalachian bluegrass performers sharing the stage. · An excerpt by Houston Grand Opera To Go of The Clever Wife, a popular Chinese folktale about a young wife who must rescue her foolish husband from a magistrate’s impossible tasks. · Texas-based Riyaaz Qawwali performing the ecstatic devotional music of the Sufi tradition. · Indian classical dance by Shipra Mehrotra, a Houston-based Odissi dancer and teacher who has performed internationally. The First Look Festival also marks the opening of Treasures of Asian Art: A Rockefeller Legacy, a not-to-be-missed exhibition of more than 60 masterpieces from the Mr. and Mrs. John D. Rockefeller 3rdCollection at the Asia Society Museum in New York. Visitors are encouraged to transform their cell phones into audio guides for a richer experience of the exhibit, which continues through September 16 in the Louisa Stude Sarofim Gallery. In the Allen Sculpture Garden artist Lee Ufan’s Relatum– signal, a 2011 work commissioned especially for the space, will be unveiled in the Allen Sculpture Garden. The Art of Emptiness, an exhibition of Lee’s watercolors, will be on display in the Sarofim Gallery. Contemporary Asian Art: Texas Connections, an exhibition featuring works by pan-Asian artists, borrowed from private and public collections throughout Texas, will be on display in the Fayez Sarofim Grand Hall and the North Gallery. Food trucks and The Stone Café at Asia Society will offer refreshments for purchase. A full schedule of the festivities will be posted on the Texas Center’s website http://www.asiasociety.org/texas in coming weeks. MPNA is hoping to secure a grant through the 'Love Your Block' Grant program sponsored by the City of Houston Volunteers Initiative Program. If our application is chosen as one of twenty possible awards, the Neighborhood Association will receive a $500 grant through the Home Depot Foundation. 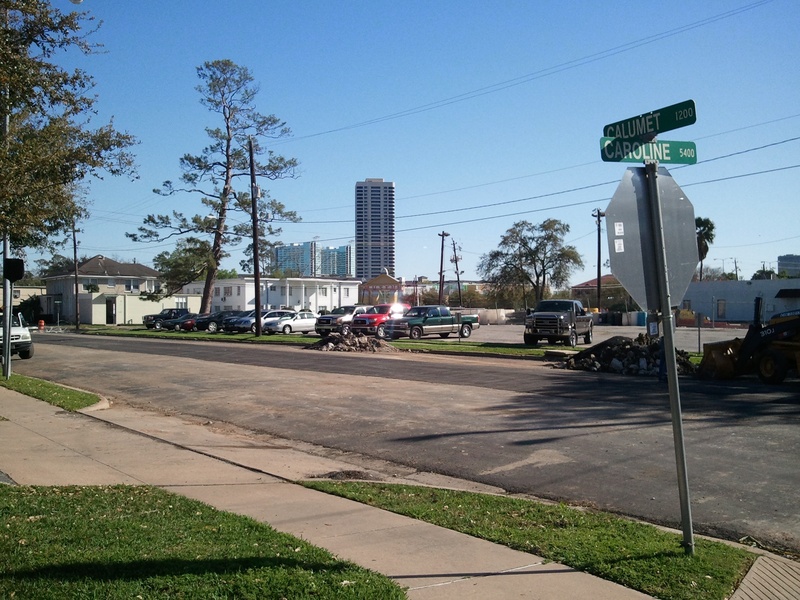 The MPNA grant application targets two esplanades at the corner of Southmore and Caroline for improvement. Winners will be announced during the city's Arbor Day of Service, April 27, 2012. Thanks to Kathleen O'Reilly and her assistants in completing the grant application. Big Changes are underway for the Holocaust Museum's parking options. The museum has purchased the block between Austin and Caroline on the south side of the museum building where construction of a new parking lot is in progress. Removal of the esplanade has been completed to make way for a parking facility that will more than double the current area. All Holocaust Museum parking will be accessed through the new entry off Caroline Street. 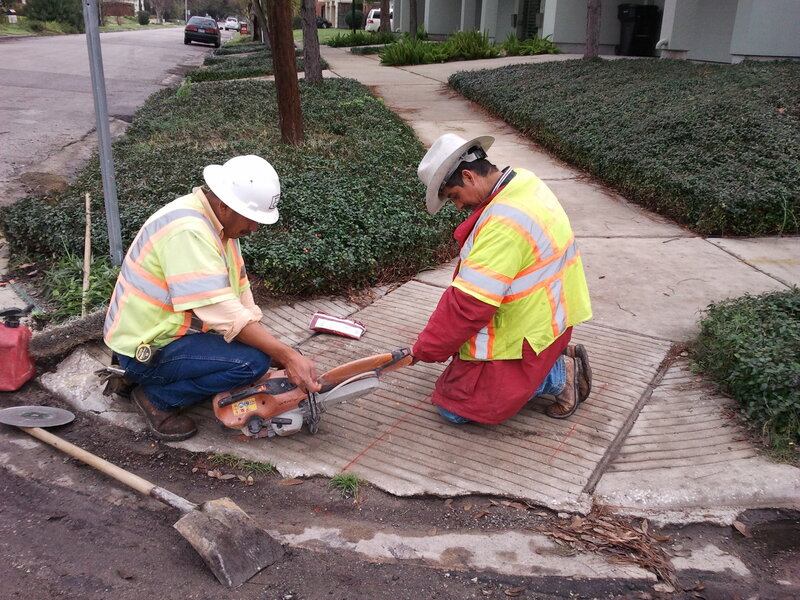 Our street corners in our neighborhood are being repaired by the City of Houston. Thank you to the hard work of the Beautification Committee for making this happen! The Museum Park Neighborhood Association members joined in planting over 300 trees on Saturday to replenish the trees lost during the drought.